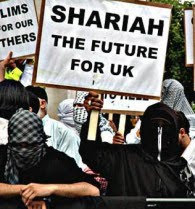 European countries are certainly not the right place for Muslims who want to live under sharia law. Muslims who are unhappy with France's recent decision to ban the veil should find a more suitable place to live, such as Sudan, Saudi Arabia or Iran. 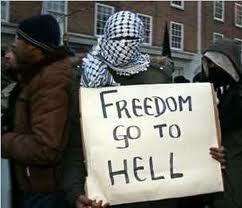 There, they would feel free to wear the burqa and the niqab and build as many mosques as they want. Just as Saudi Arabia bans the construction of a church or synagogue in Mecca and Medina, the Italians and the Spaniards have the right to limit the number of mosques in their countries. Muslims who see the establishment of a church or synagogue in their neighborhood as a provocation have no right to complain when non-Muslims express the same sentiments about mosques. Would it ever occur to a Christian or Jew to move to Saudi Arabia and demand the right to drink alcohol and eat pork? Can anybody imagine what would happen to a Christian if he or she were wearing the cross on the streets of Jeddah in Saudi Arabia? Or if a Jew wearing a skullcap were seen walking in the streets of Kabul or Khartoum? Just as most non-Muslim women do not feel comfortable living in Islamic countries where women must cover their heads and faces and are not allowed to drive a car, Muslims have no right to impose their lifestyle, culture and religion on others. Non-Muslims who travel to Islamic countries often respect the laws, traditions and religious beliefs of their hosts. Christians who have broken sharia laws in some Islamic countries often find themselves behind bars and end up facing deportation. But why is it that when Muslims goes to live in a France, Britain and Canada, they do not hesitate to demand that the people living in these countries accept their ways? A Muslim woman who wants – or is forced – to wear a veil is entitled to do so – but she has no right to protest if a Western government bans her from covering her face. The ban should not be seen as an act of hostility toward Islam; instead, it should be regarded as a move intended to prevent a phenomenon that even many Muslims see as an act of degradation against women. Radical Muslims who are trying to impose their will on Western societies are only causing damage to their faith. The campaign launched by some Muslims against the French ban will only alienate non-Muslims and increase their concerns about Islam. By challenging the French ban, for example, Muslims are telling the French people that they are more interested in separation from Western culture than integration. Muslims living in Western countries have the right to practice their religious beliefs and traditions, but they should not expect non-Muslims to accept everything they want.